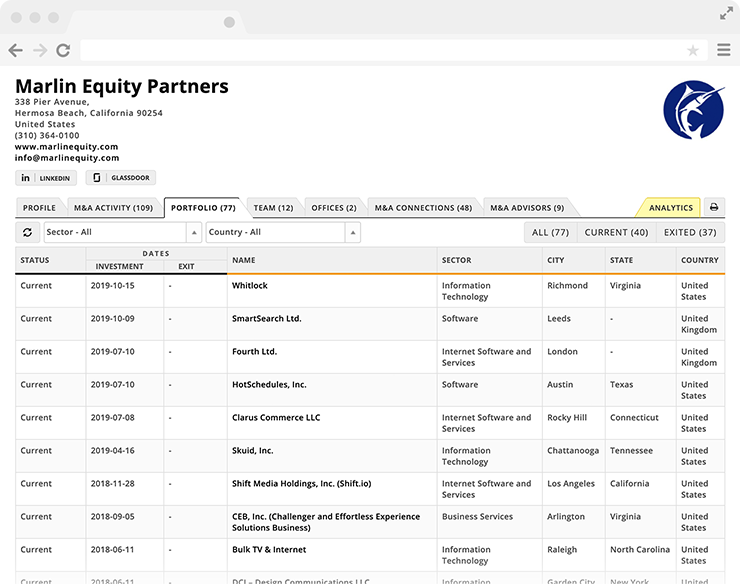 Mergr is a lightweight, easy-to-use database that allows you to effortlessly identify private equity firms, corporate acquirers, their M&A, and advisors. 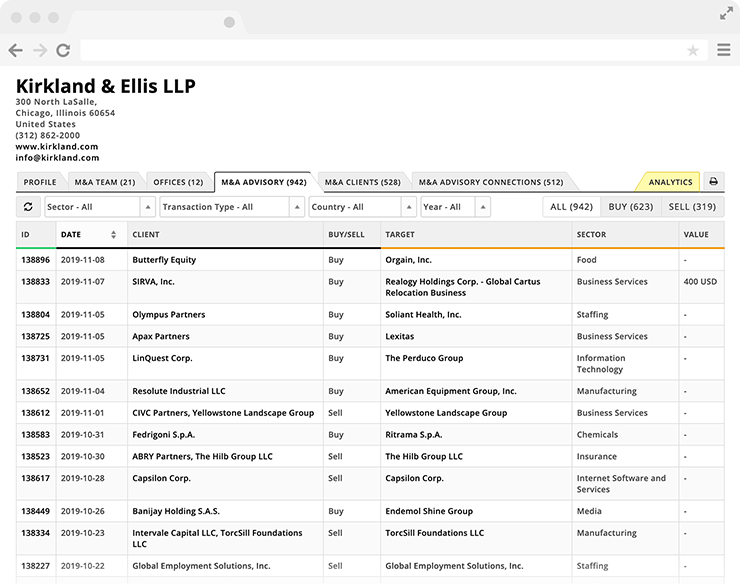 Every day, we track those engaged in M&A - so you don't have to. We cover private equity firms, companies engaged in M&A, and M&A advisors exclusively. and advisor profiles - all focused on M&A. Review a detailed summary of Marlin Equity's investment interests and M&A activity. 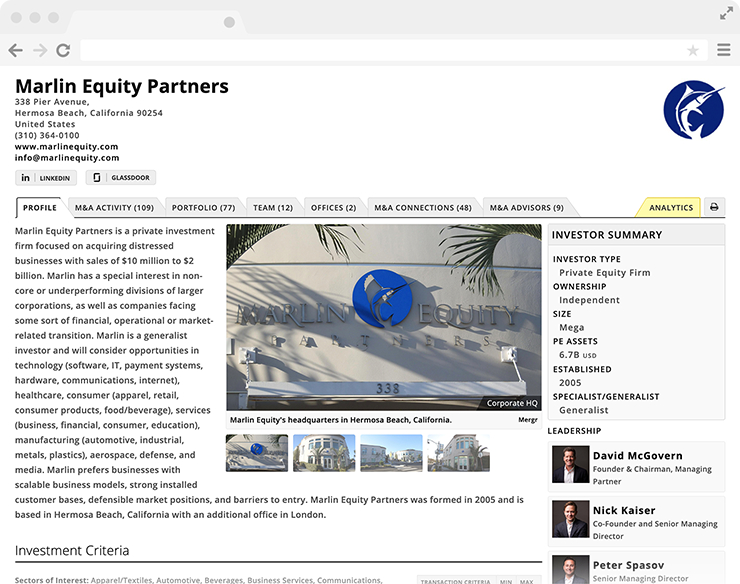 View and filter Marlin Equity's current and former portfolio companies. A brief overview of VMware and its M&A history. View and filter VMware's history of acquisitions (and divestitures). View a snapshot of Kirkland & Ellis' M&A summary and transaction expertise. 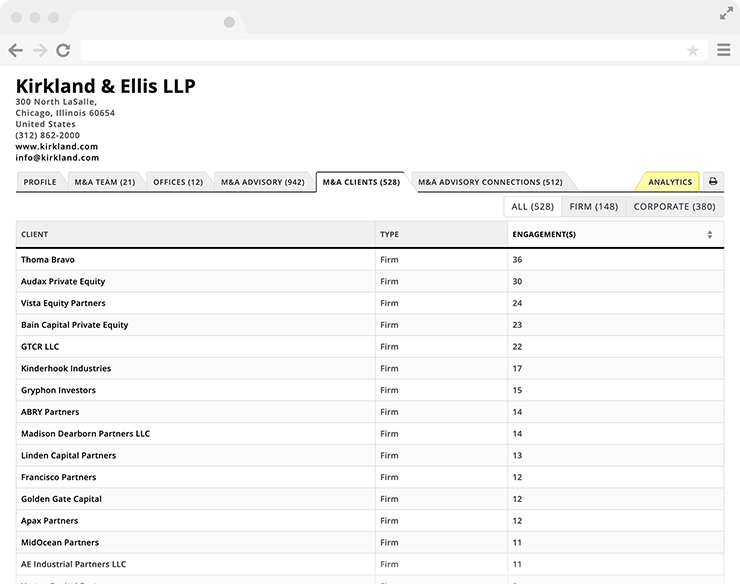 Get a rundown of who Kirkland & Ellis' top M&A advisory clients are. 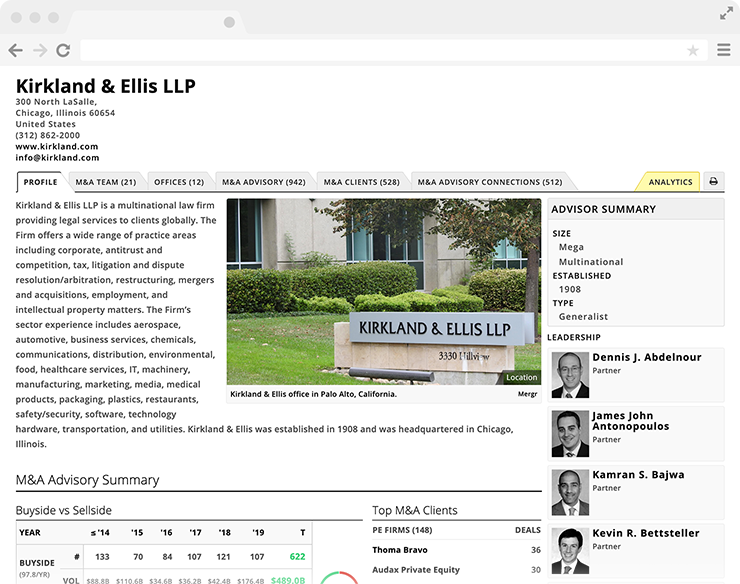 Review and filter Kirkland & Ellis' Buy-side and Sell-side M&A advisory history. Create custom lists of private equity firms using firm criteria, stated investment interests, or actual investment activity. 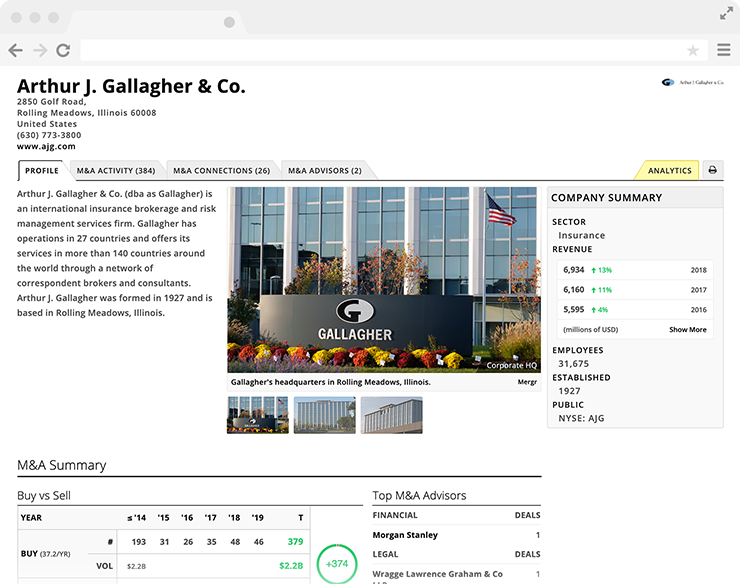 Look-up companies by ownership or filter based on acquisition or divestiture histories. Search transactions by target, sector, size or situation - or filter based on acquirer or seller types. Isolate private equity firms or corporates that most actively buy/sell by sector, location, or year. Find out how private equity firms, advisors, and corporates are connected - as co-investors, buyers, sellers, or advisors. Active LinkedIn user? When researching PE Firms or Advisors, quickly identify your 1st and 2nd degree connections with our LinkedIn plug-in. 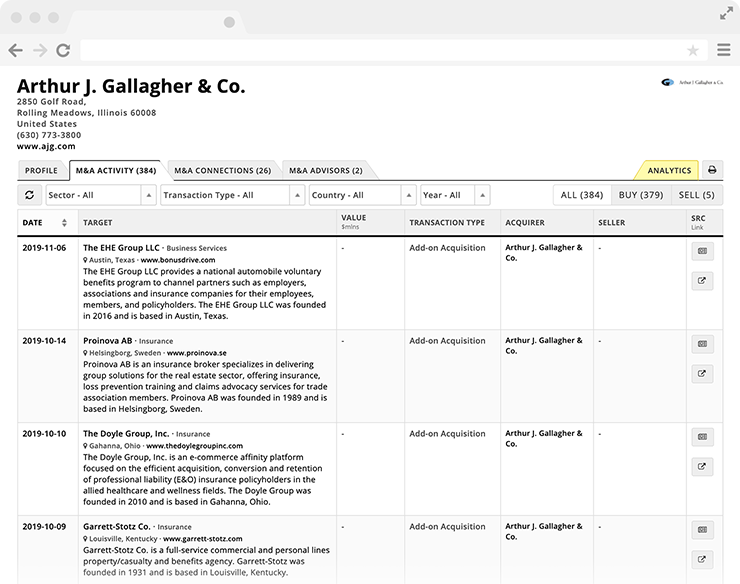 Quickly discover past and present transactions by keyword searching (in real-time) the contents of 10s of thousands of M&A press releases. Which public companies have been the most active aquirers in the chemicals sector the last four years? Who has 3M bought from and divested to? Who are the advisors 3M has worked with? What were the largest acquisitions in the state of California last year? Which private equity firms not based in Germany have invested there? What companies have acquired PE-backed software companies in the last two years? What advisors have worked with companies based in Minnesota? Who are the professionals that work for New York City-based private equity firms? What companies have been the most active sellers in the last year? New records, transactions, and data added every day. Instantly get up to speed researching all record types. Slice, dice, and search the Mergr database without constraints. I have not come across a more user-friendly, cost effective tool for researching mergers & acquisitions. What next? Benefit from the world of PE and M&A today. Just $150/monthly. No contracts. Cancel anytime. Mergr makes M&A analysis simple and productive.